I am Paula, I live in the Boston area but I am originally from Ireland. I have a tawny/fawn briard female named Moselle who is almost two. She is my shadow and foot warmer. She shares our house with a very senior dalmatian Baxter who has always been a gent except at feeding time and a four year old rough coated tri-colored collie female -Muirne - her name describes her well! 'High-spirited' in Irish - she is the rascal in the house . Plus two cats Tinks and Derwyn my ginger tom. I have been a member for a while and really enjoy the postings and photographs. Hopefully there are a few members in Ireland also on the list as I cannot find anyone in Ireland with a briard! I have just arrived in Kentucky to attend my first US Briard National, so looking forward to a five day briard fest! hi Paula.welcome to the FBC. let us know how it goes in Kentucky.. Welcome to the FBC. I am Irish, from Limerick but live in Wales. I think there are a few Briards in the Cork area. also, thanks for the welcome!! Thanks for the welcome and for the Irish folk checking in with me! Enjoying Kentucky! Meeting lots of dogs and their owners. I'm new to this site as of yesterday. I'm Jackie and I have 2 dogs; Roxy and Milly. I have had them for 2 yrs in December and they are rescued from Italy. I always thought they were mongrels until last Saturday I met a lady at the vets. She said that Roxy was definately a Briard. I googled it when I got home and sure enough Roxy is the spitting image down to the double dewclaws on both feet. I have now decided to grow her hair long instead of having it all cut off! Milly, Roxy's sister however doesnt look like a Briard and is more like a terrier of some kind. So I've done some research on the breed and looking to find out more about them. Hi Jackie and Welcome to the FBC. Looking foward to hearing more about both of your babies. my name is Iris and we have 1 1/2 briards living with us here at Canada's West Coast. Bobby, a 10 1/2 yr old Briard x OES. He is just marvelous! And then there is Felix. 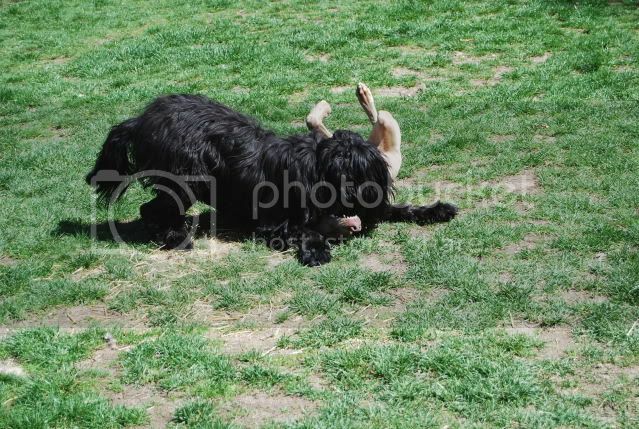 Felix is a blackk borne, grey Briard. He turned 2 last October. If anyone says Briards are calm dogs, has yet to meet Felix. Felix enjoys work. He will work for work, not for treats. Felix has started Agility but we have been on a break for a while. He is currently in love with obedience and has also met sheep for the first time late last fall. We are waiting for the snow to melt, so he can go back to doing the one thing he is a "natural" in. Soon he'll be learning tracking! Welcome we're a friendly bunch as advertised, love the name Felix for a briard. How lucky to be able to track with him, Roxy follows scents but they're mainly the fox pooh variety! We're a family living in Spalding, Lincolnshire, who are about to collect our lovely fawn boy Merlin from Shani Lunnon at the end of this month. We've been waiting, researching, saving and otherwise preparing for this for eighteen months, which is when I first joined the site, while we sought a breeder with litters. Even right up to recently, I thought I would have to go to Afghanistan with the RAF Regiment and that would put everything on hold again, but it's off and we're free to carry on. It's been a delight dealing with Shani and meeting her family of Briards. The pups are gorgeous but the grown ups made a real impression on us! I've had German Shepherds and Border Collies in the past but haven't had a dog for years, so we decided with a new house and a more settled life we should make things complete with a new family member. Everyone is waiting in eager anticipation, and it's just the right time of year to bring a Briard up. Spalding is a lovely country area with easy access to the beach near Hunstanton, and Merlin will be coming to work with me, also in a lovely open area. The FBC has been an excellent source of advice and anecdotes, and I used it to buy a recommended book on the breed. There really is a strong feeling of companionship which we hope to add to as the years go on. Many thanks and speak again soon! I saw the photo of fay with Merlin (another fantatsic briard name) on Facebook he looks a sweetie, and so tiny. It's sounds as if he's going to have a fantastic life countryside and beach what more is there. Hello. It's lovely to meet you all. I live in Surrey and have a 10 month black boy, who I called Zizou. He is our first dog (I say "our" in case my husband sees this ) We wanted a Briard for years, having fallen in love with the breed in Switzerland and France. We've had Zizou for 4 months now. I maintain that Briards are the best breed on the planet. You are right they are the best breed on the planet! As well as Embre, I have an 8yr old Rhodesian Ridgeback and a 2yr old Ridgeback x Weimaraner and also foster for rescue, so various other waifs and strays ... luckily we live in a farm house with over 2 acres (10,000 sq m for the metric people!) of land. I would love to get into showing, so I'm doing some research and have been happy to discover that Embrujo has some very good names in his pedigree I just hope I'm not too late with him having had no ring craft lessons! We are looking into getting our second Briard, hopefully a fawn from a breeder in France (my parents live there, so no problems crossing borders). Hello Faye. Niice to meet you. Those are lovely photos. 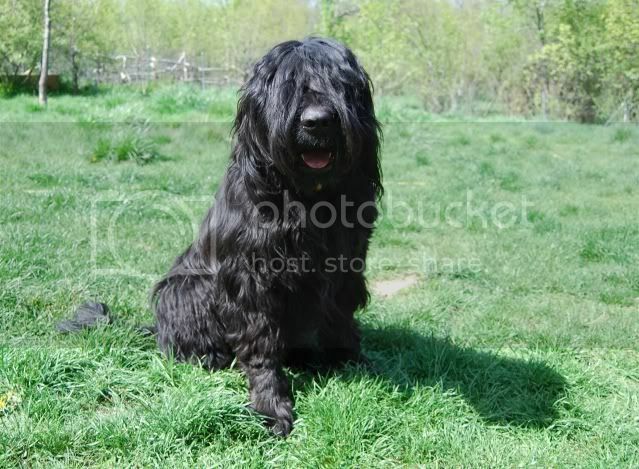 I also have a black briard, who will be one soon. As you can see, I am still trying to sort out a way to get some pics up. One of my dog's pals (walks with regularly) is a Rhodesian Ridgeback. If I had more land, I'd have a pack of dogs too. I'd add a fawn briard and two bearded collies....for starters. 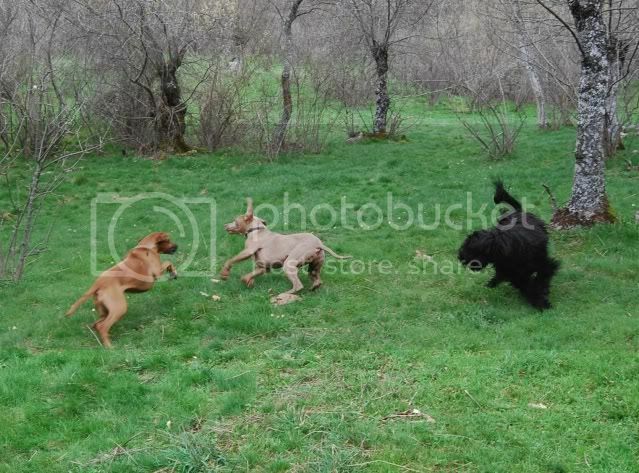 We have a fawn briard Meadow and live next door to weimaraners Harry and Gracie,and they on famously, especially Gracie who loves following Meadow and clinging on to her ear.. I've just noticed how many new members we have had over the last few months, I'd like to say Hello and Welcome to you All and your furry babies, and to say that if you need any help there is normally some on here that can help you. You're boy looks lovely and he's got lots of land and mates to play with, he's landed on all four paws. I know nothing about showing but if you post a question on here there's a lot of posters who will help you out. We've got a black Arrowflec girl named Roxy, who can be a bit of a madam! Various dogs came and went, including Valentine, Boogaloo ( he was massive) both have places in the history of briards in the UK, as does Emily. Or should I call her ch Emily Desamee Bear at Rolverden. Hi Graham and welcome to the FBC! I'm glad you finally managed to become a member of the site! I'm sure some of the members on here will remember your mum in the breed especially as she had one of the first ones in the country. Maybe I'll bump into you again soon! I do look out for you in chippenham at the garage. Saw the Puli last week, which we had one of too. Think he was a Nancy cast off. Huggy Bear. So over 20 + years ago now. 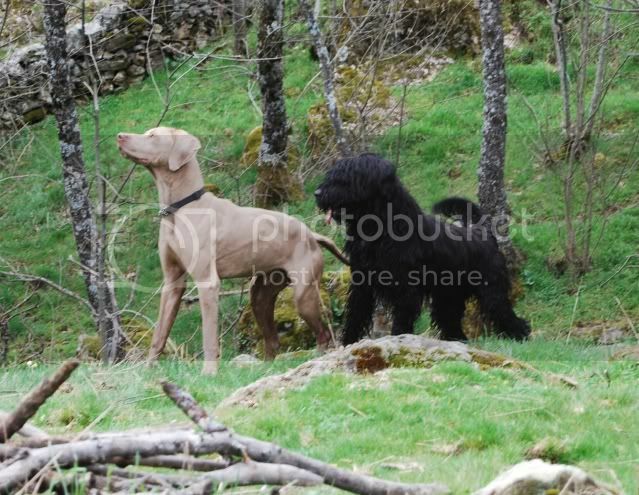 I live in Greece and I have two fawn briards a female Blondy and a new male member Marvel. In the past i was asking informations about England cause i went and worked there as a dog groomer for a year but i couldn't find a place that would accept me with my dog, so i came back cause i was really missing her.Now Blondy is 9 years old..the princess of the house as i 'm calling her and recently we have a new member a male briard almost 10 months old. Two weeks ago he went in his first show..in junior class and he did great i 'm so proud of him! Well..it's nice to speak to you again..see you around! Woe, so many new people & furries. Hopefully we will be able to meet some if we can get to the fun show this year. We hail from Manchester but now live in Cornwall, via France. Our beautiful girl is 7 years old & adorable (aren't they all). Nice to read all the stories. Just realised a lot of these are old posts. Put it down to a very fuzzy head & medication. Great photos - they look lovely. And your English is just fine!! Welcome. This might help if you are looking for a Rescue. We are very fortunate with Briards that it is not very often the services of Briard Rescue are called upon. Providing of course that the Breeders have done their work properly and have explained the pros and cons of Briard ownership, they are not just the fluffy bundle of fun that many people think they are. Then hopefully they stay in their new homes without any problems. Of course the unexpected can happen and then another home is found if all else has failed. Briards are very fond of their families and it is extremely upsetting for a Briard to leave the home they are used to. However they can adapt to a loving environment if given the time and care they need. The main reason for a Briard needing a new home is that it has been allowed to become too boisterous, and consequently out of control! The British Briard Club, call Sheila Cann on 01252 518472. The Briard Association, call Nikki Rual of Gilcoru Briards on 01443 672089. For rehoming the FBC recommend that you contact the Briard Rescue first, however if there is any particular reason why you do not want to contact Briard Rescue you are free to contact the Friendly Briard Club in confidence. Don't forget to mention that you are phoning after finding their number on the First UK Briard Website! Welcome Russell, and good luck with your search for a fawn. Welcome Russel, & good luck with your search. new to this forum. Me and my fiancé just got our first briard. His name is Obelix (from Astrix), born in April 2014. Beautiful tawny boy! He is 11.5 weeks right now, 22 lb. He is the smartest (and smallest) of a litter of 5. We've already taught him the standard commands (sit/down/leave it/ watch/shake). It seems like he is going into "challenging for leadership" stage right now, so wish us luck. Welcome Angela and Daniel! Ha ha, having got through the puppy training, you now have to deal with the teenager! Wishing you lots of luck. I'm sure it'll be loads of fun! Have you posted any photos yet?! Welcome, I love the name. Please do post some photos - it's really easy and we're all suckers for puppy pics.